So, it’s been a while. Over two months, actually. I meant to write this post in mid-August to wrap this blog up, but as JVC ended, and I began my new life as a “real person”, I got a bit distracted. Hey, it happens. But I’m back now. Well, I’m back for one last hoorah as TheVolunteacher. Here’s a quick (okay, probably not quick) rundown on what’s happened since I last wrote. I joined about 40 Jesuit Volunteers in hiking about 30 miles of the Appalachian Trail at the beginning of August. It was intense, it was awesome, and I may actually still be sore from sleeping on the ground (or maybe it was the hiking part…). Regardless, it was a lot of fun. I had never even slept in my own backyard before, let alone gone hiking for 3 days in the wilderness of Southern Pennsylvania, but I enjoyed it. I was able to bond with some JV’s who I didn’t normally get to talk with. I got to hear more of their stories, talk sports, learn about their plans for post-JVC, and reflect on the year. It was a great experience, and one that I will never forget. I’ve attached some photos from the trail below. (As a side-note, thank you to all those who helped support me and my goal to raise $500 for JVC for this hike. Your generosity helps to ensure that great people in JVC continue to do great things for those in need, helping to make our communities, cities, and the world a better, stronger place for all). After the hike, we arrived at Blue Ridge Summit, where it all began last August, for Dis-Orientation, JVC’s closing retreat, joining the other half of JVC-East. Here, I earned my first ever “F”. No, no, we didn’t receive grades as JV’s (we all know I’d get an A+, duh), but we officially finished our year as Jesuit Volunteers and became Former Jesuit Volunteers (FJV’s). It was an odd few days. We all knew we would be saying goodbye at the end of Dis-O, but we all kind of pretended it wasn’t actually ending. So, what did we do? We had a great time together, that’s what! We had ample free time to spend together, heard from FJV’s about post-JVC life, hung by the pool, dined on the finest of foods, and celebrated a successful year. On Friday morning, we ate, packed, said a prayer, and said tearful, yet joyful, goodbye to one another. It was then that it hit me that JVC was over. It hit me that this amazing group of people meant a ton to me, and that we’d probably never all be together again. It hit me that my new life was starting. And it hit me that I had truly been “ruined for life” as the JV tag-line says. Not to be overly dramatic, but never again will I be able to look at the world in the same way; I know too much now. JVC has opened my eyes to so much, and made me think in ways I never really thought possible. I look back at the me that started JVC, and, really I’m the same Tom O’Keefe. But so much has changed, too. And now, here I am, almost 2 full months into my new job at Cristo Rey Jesuit, moved into a house with good friends Nick and Rick, and making a life in the great city of Baltimore. Way back in August of 2009, I wrote of starting JVC, “It’s scary, nerve-wracking, a little bit sad and a little bit happy, but mostly it’s a truly exciting time.” I feel a lot of those same things now. But really, it’s different, and I can’t really explain the feeling, but I know I’m exactly where I’m supposed to be. And that’s a great thing. So, I guess this is the end of TheVolunteacher. I really enjoyed writing in this space. It was a way for me to fully flesh out and reflect on what I experienced. Thank you to everyone who took the time to read it. Your support means so much. Keep spreading the good word, remember that life is good, and stay well. In the past, I’ve talked about why I went into education for my year with JVC. I found myself passionate about education and how it should be the great equalizer in our country. (Side-note: I can’t exactly remember when I realized that, while our country is based on “equal opportunity”, it doesn’t always give the same opportunities to our children, but it’s completely rocked my world since). Anyway, this year, working as a teaching assistant at Cristo Rey, I realized that, while I was passionate about education and equal opportunity, I wasn’t suited to be a teacher. It simply isn’t my thing. (Another side-note: I am forever a bajillion times more appreciative of all teachers. It’s really hard sometimes). I gave a lot of thought in March, April, and May about what I wanted to do when JVC ended. Should I do what I was “trained” to do and work in public relations? But what about all I had learned about and become more passionate about this year? How could I translate that into full-time (paid) work, but not teach? That, and where do my strengths lie? But then I went back to what we talked about at Re-Orientation and finding the intersection of what we’ve experienced this year and what we’re “going to do about it”. 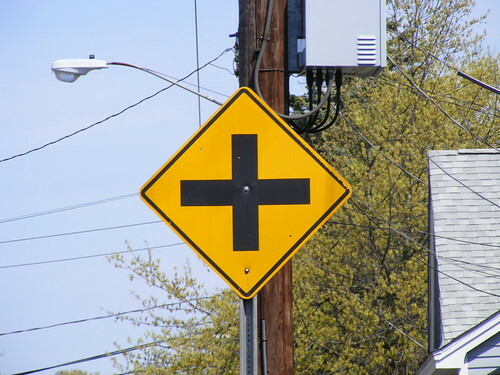 So, through all that, I realized that I needed to find my own intersection for my career. I had to find the intersection of Passion Street and Skills Boulevard. And, luckily, the Corporate Sponsor Representative position at Cristo Rey was right on the corner. So, my advice to the folks out there looking for jobs or wondering what you want to do: find what you’re passionate about, figure out what you’re good at, and find where those two things intersect. It will leave you happy and your work meaningful! I’m wondering, and it’s not a challenge, how do you give back to your community? Where? When? How often? Why? Do you donate to charitable foundations? What do you donate? To who? How often? Why? Do you do something else instead? I’d like to know, so comment away! Kristina is spot on. Sometimes, it’s easy to lose sight of this idea as a full-time volunteer. We want so badly for everything to go well and get better now that we can forget that we’re working for long-term, too. It’s important that the people we advocate learn to develop their own voice, so, someday, they have a voice for themselves and help others attain a voice as well. We shouldn’t be doing for. Rather, we should be doing with. My housemates and I are fasting. We’re eating rice every for every meal for nine days straight. Rice at every meal for Nine. Whole. Days. That’s 27 meals. For nine of those meals (dinner each night), we’re having Haitian rice with kidney beans, garlic, and onions. Other than that, we can only eat 3-6 cups of rice a day with seasonings or basic sauces (e.g. not with chunky salsa or meat sauce), and drink any type liquid. So, to answer your question, yes, we are crazy. Why would we want to put ourselves through the hunger, the same meal every day, and the temptation to eat anything other than rice? Three reasons: Solidarity. Simplicity. Sacrifice. Rice is a staple for more than half of the world’s population. Most of the world quite literally lives on rice. It’s cheap, relatively filling, and has become an important part of many cultures across the world. Simply put, rice means life for many people. In this way, we’re attempting to gain some solidarity with much of the world. Coordinating meals, grocery shopping, and cooking for six people each week is time consuming. 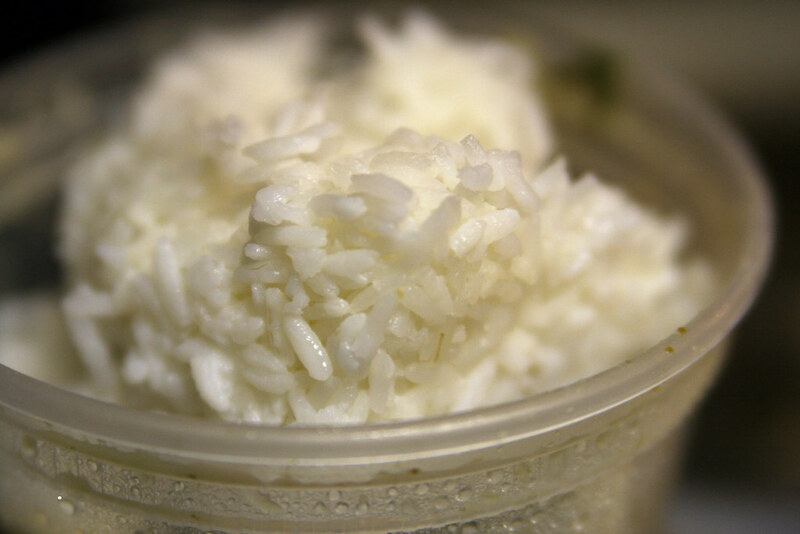 Rice is a simple meal, and it doesn’t take much time, effort, or planning to make. Put it in a pot with some water, cook it, add seasoning, and eat. Boom. Done. So, what does that mean for us? Well, we can spend more time on things like prayer, community, and Lenten activities. It’s a way to simplify our lives for the week. It’s Lent. Lent prepares Christians for Easter and Jesus Christ’s sacrifice for mankind. The forty days of Lent represent the forty days that J.C. spent in the desert fasting where he was tempted by the devil, but held true to G.O.D. So, fasting and sacrifice are big parts of Lent. By sacrificing what we usually eat and resisting the temptation to break the fast, we’re acknowledging and honoring his actions for our sake. So, we may, in fact, be crazy, but really it’s not much different from what most of the world experiences. Plus, it gives us a chance to simplify, and allows us to pause to honor Jesus. So far, 14 meals in, I’ve been hungry earlier before each meal and feeling “full” is rare, but it hasn’t been a huge deal, especially with these three things in mind. It’s definitely been a challenge, but, like this whole year, it’s been a good challenge and one that allows for great learning and reflection. Free Rice – A cool website where you can donate rice simply by answering vocabulary questions. The question could very well have referred to the present, and the answer would still hold true. As I begin to consider my path for post-JVC life and grapple with what is happening in the world, I’m doing my best to work towards what makes sense and what is good. What is hope for you? Where do you find it? What makes sense to you and how do you work towards it? I’m not even sure how to start or even write this post. It’s something that’s hit me hard, so I apologize if it’s a bit of a jumble. I spoke with my mother earlier today. She told me that a friend’s daughter, and the cousin of a good childhood friend, was in the Hotel Montana in Port au Prince on the morning of the earthquake and has not yet been found. She is a Lynn University student and had traveled with a group of students and staff to stay at the Hotel Montana in Port-Au-Prince the morning of the earthquake. (More details can be found here: http://www.lynn.edu/alert). They’re still searching for her, and her family and friends are hoping for a miracle. Today, Thursday, she turns 20. Whenever things like this happen, I can’t help but wonder, “why?” Why do bad things happen to good people? How can God, a God I believe to be just and caring, let something like the earthquake in Haiti happen? Why does God work in these ways? Why must these families have to grieve for their children like this? Why must a country as troubled as Haiti be burdened with more devastation and suffering? Why does the most earnest and genuine student struggle the most with his grades? Why must the world work like this? Why? It was so easy for me to watch the news and see what happened in Haiti last week and feel bad and give money and then move on with my life. Now it’s finally hit home. I feel so much sorrow and hurt and anger. And the worst part is that these feelings don’t come close to the pain and hurt that many others must endure this week. Those who are there and those who lost friends and family. It hurts to think about it. I like having answers to things, I do, or I like at least being able to rationalize them. It’s so hard not to have answers. I do my best to trust in God and sometimes, that’s all we can do. So, pray today for the family of this young girl. Even if you don’t believe in God or the same god as I, pray for, hope for, will for a miracle. And, please, pray for all those affected by this horrible event. You are currently browsing the archives for the Social Justice category.